The skin of an artwork speaks of the singular visual vocabulary of its maker. Each of these artists found a way of making a unique skin, either by using nontraditional materials or by employing traditional materials in an unusual way. This exhibition features the work of Josh Blackwell, Martin Bromirski, Sharon Butler, Suejin Jo, Scott Richter and Drew Shiflett. Josh Blackwell’s skin is plastic. Elaborating upon everyday experience, he makes intentionally redundant objects from found materials that explore the humdrum rituals of use. Treading a precarious path between convenience and excess, the plastic bag has occupied his attention for the past seven years. Martin Bromirski tends to torture the skin of the canvas. He deliberately picks cheap ready-made canvases that he paints, rips, cuts out circles, washes in the sink, scrapes, sands, patches and stains till the history of all his trials and errors produces this effect. If he stops from exhaustion, he deems that it is the right skin and moves on. 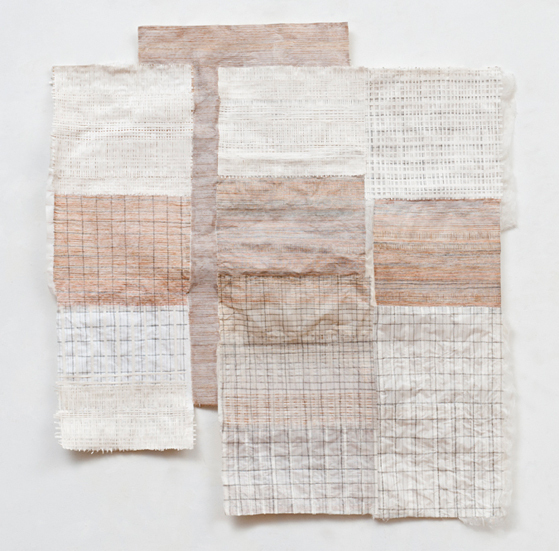 Sharon Butler subverts the traditional use of common materials. Her raw canvases are pinned on stretchers in peculiar disarray, unsettling the viewer and causing them to focus on the image in order to figure out why it is sitting there: Is it lost? Does it need help? What does it want to say? Suejin Jo paints with oil and acrylic paint in a nontraditional way. Deeply interested in the texture of the picture surface, she painted with oil and dry pigment for over a decade despite health risks. Experimenting to find a healthier alternative led her to discover oil and acrylic paints wet on wet gave a unique skin to the painting.Scott Richter makes his own medium to give a distintive skin to the work, undergoing considerable effort and expense. He believes that words strip the work of mystery and the dialog with the viewer. His well-known pieces are brilliantly constructed with impasto oil paint and airy whispers circulating among the clearly defined forms. Drew Shiflett uses the traditional materials but her way of building the skin of her art work is anything but traditional. She repeatedly draws, paints, cuts, glues, layers, pulls and builds until all the element evolve to reference a sculptural wall or relief.